This NovomaticCasino.co.uk slot has been designed and created by some of the best in the business. If you’ve ever dreamt of being at the heart of a police investigation, having to piece together the clues and find the perpetrator, then this is the slot for you. Playing Il Commissario is better than watching any episode of any crime show, because instead of just being an observer as the investigation unfolds, with this NovomaticCasino.co.uk slot, you can actually be a part of it! Set in Venice, in Il Commissario, you’ll be presented with crime scene locations, fingerprints, case files and the detective. Not only that but you’ll come face to face with the suspects and the commissioner himself! The nostalgic, crime-show-themed music will transport you right into the middle of this Italian Investigation. Just as a good commissioner would let no detail go unnoticed or unchecked during a police investigation, no detail has been left out in the design of this phenomenal online slot. Each symbol has been intricately designed, from the policewoman and the crime scene locations, to the fingerprint card values. You can see how much each of these symbols is worth, depending on your bet, by checking the paytable and you can easily change your bet (which can be seen at the bottom of the screen, in the middle) by using the plus and minus symbols to either side of it. With 5 reels and 10 pay lines, there are plenty of ways for you to win and when you spin a winning combination of matching symbols, you’ll be given the opportunity to gamble the sum using the classic double-or-nothing feature. If you correctly guess the colour of the next card, you’ll double the sum of your win – and even these cards have been designed so thoughtfully, they sport the Italian police badge logo on the back! The highest-paying symbol is Il Commissario himself, who gives you a cheeky wink whenever he turns up on the reels, and he can substitute for any symbol except the Scatter. The Scatter symbol is a clearly-marked case file, just waiting to be opened by you. If you spin three or more Scatters, not only do you get a payout but you will also trigger the bonus game which includes 15 free spins! These free spins aren’t any normal free spins; however, these free spins make up your investigation. At any point during these free spins, a ringing telephone might appear on the reels. If it stops on the screen, it will automatically be picked up and a hint regarding the identity of the suspect will reveal itself. Don’t worry about making notes – the game will remember for you. However many clues you receive during your free spins, at the end of the bonus game, you’ll need to make an informed decision as to who you think is the suspect. If you get it right, you’ll close the case and win a multiplier of up to x20! How’s that for satisfaction? 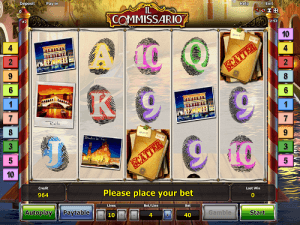 Normally they say that crime doesn’t pay, but in this Il Commissario slot, it really does and NovomaticCasino.co.uk is your partner in crime – place your bets and watch as your balance rises! For fans of Chicago, this slot is definitely worth a try. If you’ve enjoyed the thrill of playing Il Commissario, why not give NovomaticCasino.co.uk’s other thrilling games a go? Our table games, such as: Sic Bo, Royal Crown 3 Card Brag and Multiball Roulette are a must, as well as our live-dealer games, including: Live Baccarat, Live Blackjack, Live Roulette and Live Poker.